The Great Lakes Construction Company and GPD Group constituted the design-build team for Section 2 of the Cleveland Opportunity Corridor. The second phase of a project bringing job opportunities to a portion of Cleveland referred to as the "Forgotten Triangle" has opened. 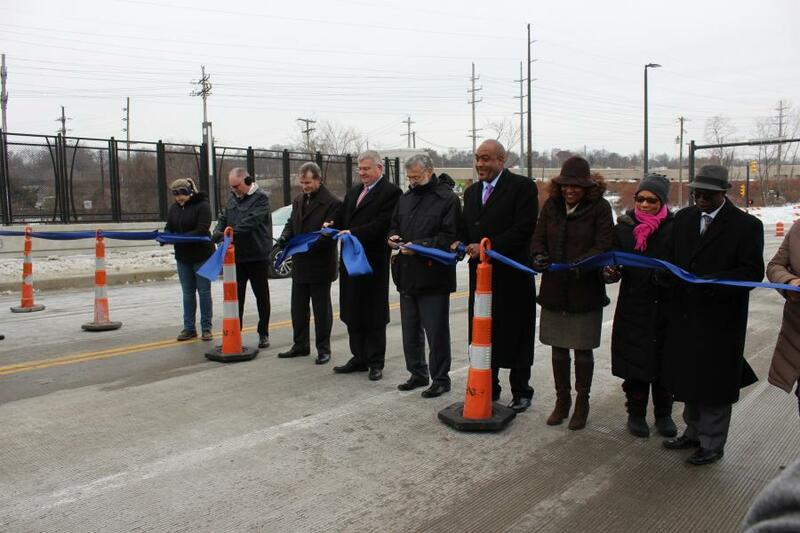 Ohio Department of Transportation (ODOT), city of Cleveland, Greater Cleveland Regional Transit Authority (GCRTA), The Great Lakes Construction Company, stakeholders and community members gathered Nov. 29 to officially cut the ribbon on Opportunity Corridor Section 2. This section opened to traffic in late-November and features a new roadway between East 93rd Street and Quebec Avenue. 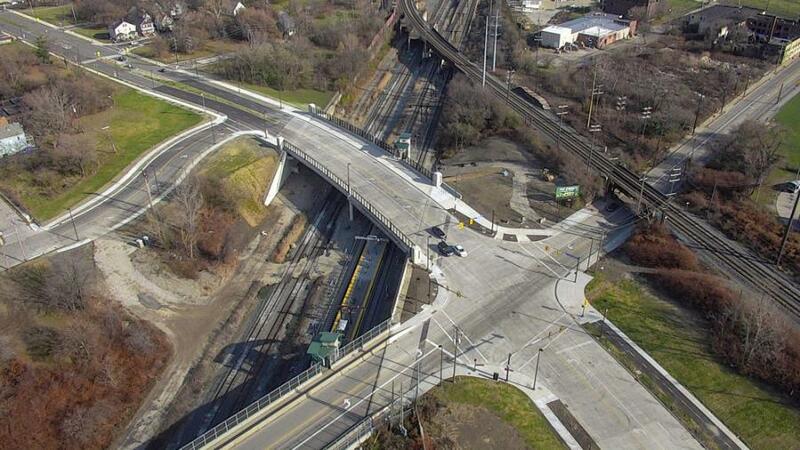 It includes the new East 105th Street Bridge that passes over Norfolk Southern Railroad and the newly expanded Greater Cleveland Regional Transit Authority station platform. The Great Lakes Construction Company and GPD Group were the design-build team awarded the contract to construct Section 2, which began construction in the spring of 2016. "Great Lakes Construction Company is proud to be an integral partner in the Opportunity Corridor Project that is transforming this important part of the city of Cleveland," said George Palko, president/CEO of The Great Lakes Construction Company. The $35 million project was funded by the Ohio Turnpike and Infrastructure Commission, Cuyahoga County, city of Cleveland, GCRTA and NOACA. "We are truly thankful for our funding partners as well as the construction companies that helped build this historic project. Outside of the transportation benefits it could bring to the Cleveland area, this effort opens the potential for new economic development, new jobs and a new identity for the community," said Myron Pakush, ODOT District 12 deputy director. "Not only have we met all of our goals so far for local hiring and on-the-job training, we've exceeded them." Minor operations will continue into spring 2019, such as final touches at the GCRTA station, permanent striping, concrete sealing and landscaping. During this work the road and bridge will remain open to traffic with minimal disruptions to traffic. Section 1 of the Opportunity Corridor, which included the widening of the existing East 105th Street between Quebec and Chester avenues, was completed and opened to traffic in the fall of 2017. Kokosing Construction Company Inc. was awarded the design-build contract on the third and final section of the Opportunity Corridor with a bid amount of $150,858,250. Section 3 will ultimately connect I-490/I-77 to East 93rd Street including two new pedestrian bridges, four new bridges located over the boulevard, six signalized intersections, new water mains, new major sanitary and storm sewers, along with tree lawns, sidewalks and a shared-use path. This is portion of the road is expected to be open to traffic in fall 2021. 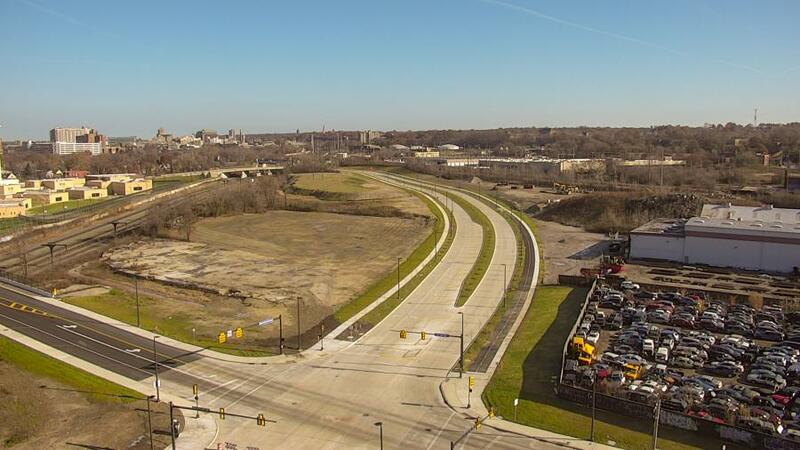 The purpose of the Opportunity Corridor Project is to improve transportation and economic development in the historically underserved part of Cleveland between I-490/I-77 and University Circle. The three-mile boulevard will provide improved access to and through the communities of Slavic Village, Central, Kinsman, Buckeye-Shaker, and Fairfax. The Ohio Department of Transportation District 12 is leading the project in partnership with the city of Cleveland.